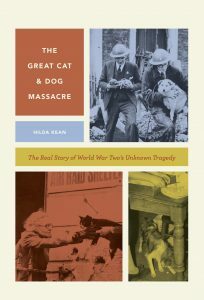 I have just finished three weeks intensive work on the proofs and index of The Great Cat and Dog Massacre. Since the focus of the book is non-human animals and their role in challenging popular perceptions of the Home Front I wanted to ensure that this focus continued into the index. So, apart from a list of the known great and the good such as Winston Churchill also listed is Nelson the black cat who comforted him. Once when Rab Butler the pioneer of the important 1944 Education Act, came into Churchill’s room and, as was often the case, found him in bed. Churchill was smoking a Corona cigar, and there was the Nelson curled up on his feet. Churchill started the conversation by claiming, “This cat does more for the war effort than you do!” Apart from acting as a type of foot warmer, the cat may well have been providing Churchill with the same sort of emotional and moral support that British citizens widely enjoyed. Of course, the cat too was being warmed and enjoying a particular wartime relationship that was also being experienced throughout the land. Thus Nelson, alongside 30 other named cats, some 60 named dogs, and budgerigars, guinea pigs and a rabbit named Minnie all appear in the index reflecting their role in the war – and in the book. Although the book isn’t due out until March I am pleased that it is already on the University of Chicago Press website for $35 and even on Amazon though of course you wouldn’t buy it there especially as it is the same price c£26 for a cloth cover with c. 30 images… The photos on the cover are taken from inside the book. The image of the dog just sitting and being in a rest centre is my favourite. Although animals were indeed rescued by civil defence staff and animal charity workers they did, of course, also play their own part in rescuing humans.